Rasananda was completed in 2009. It offered the first luxury accommodation on the beach front of Thong Nai Pan Noi. The concept is individual pool villas in a modern Thai style that combines the best of the clean lines of minimalism with the features of traditional Thai accommodation. In 2010 Rasananda won "Best Luxury Resort" at the Luxury Travel Awards. Since then demand has soared for the boutique resort. In June 2012 Rasananda will add another 20 private villas to its resort. As a result of increased demand, Rasananda has partnered up with Anantara Brand Management to improve the experience of staying at the resort. Anantara has over 4,800 rooms world wide and has resorts in such places as Koh Samui, Krabi, Phuket, Bangkok and Hua Hin. Ownership of Rasananda remains Thai. It is promised that the newly branded Anantara Rasananda will remain true to its cultural roots while bringing the wealth of know-how that Anantara have to make an even better resort in Thong Nai Pan Noi. While this might disappoint some - seeing a brand slip into the accommodation mix in TNP Noi - it will be seen as a welcome development for guests at Anantara Rasananda as they will be provided with even more luxury. Somebody once wrote that the only constant in history was change. This is as true of Thong Nai Pan Noi as anywhere else in the world. Even the Bhutanese are seeing change. It is very much open to debate as to whether change represents progress. It is also very debatable as to whether history is cyclical as the Hindus believe. Change has happened quickly on the small beach of Thong Nai Pan Noi. Since it was first 'discovered' in the 1970s it was quickly dubbed as the best beach on Koh Phangan. This perhaps is why Thong Nai Pan Noi has changed so quickly. 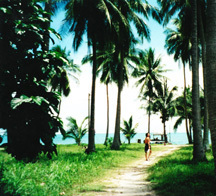 A new article on www.thongnaipan.info chronicles the changes to Thong Nai Pan Noi since 1997. It makes interesting reading. It is also a good thing that somebody is making the effort to record the change. People are much too reliant on wikipedia nowadays for their version of history. Only by recording change can we hope to learn from our mistakes, and only by preserving the beauty of nature can people continue to profit from nature's beauty. Neither of these points can be made too strongly. The picture above was taken in 1997. It7s what the walk from Sandee Bungalow (then Honey Bungalow) used to look like.